As we have previously reported, the campaign against the scheme focussed on the disturbance to Hunslet Cemetery and the loss of green space. Local Councillors took those concerns to officers and secured changes to the plans. The original plan was for a phase 1 car park of 1200 spaces with potential to increase in a future second phase. Expansion of the site has now been ruled out and it is hoped that the remaining land will be designated as protected green space so that it can’t be built on in the future. 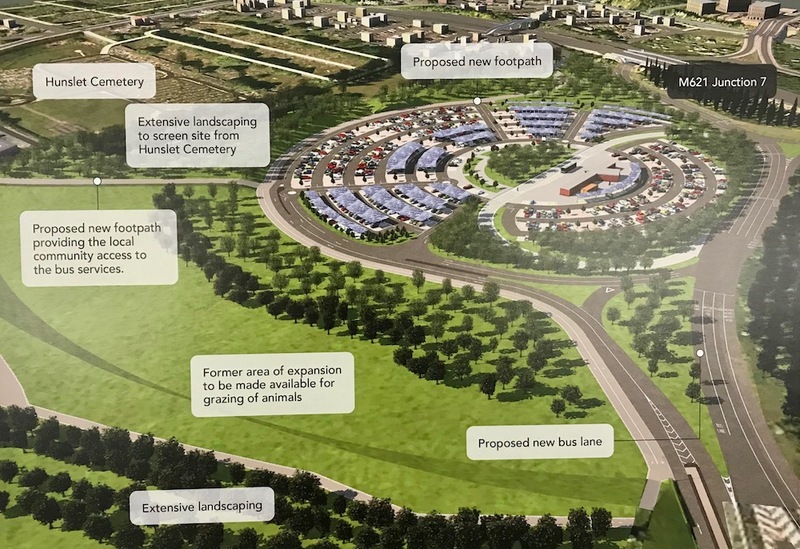 Larger scale landcaping of mounds and additional tree planting are now proposed to shield visitors to the cemetery from the Park and Ride. Landscaping will also be used to screen the site from houses in Belle Isle and Middleton. A footpath through the cemetery is to be re-routed and CCTV installed to improve security. Council officers said that alternative sites for the Park & Ride had been explored but none were found to be suitable. The scheme hopes to attract funding to mount solar panels over the parking spaces. The energy generated would then be used to run the site and any surplus go to a local district heating scheme. “All the Councillors for Middleton Park and Hunslet & Riverside have taken residents’ concerns very seriously and have worked with officers over the last few months to address those concerns. “Our research shows that once built, Park & Ride schemes will be expanded, look at Elland Road” said Mary Spencer the group’s chair. “We don’t trust the Council not to change their mind over the Green Space in the future. We want them to transfer the land to a community organisation to protect it in perpetuity. “We have seen no evidence that alternative sites have been properly assessed and we still await sight of the Environmental Impact Assessment for the scheme, despite our Freedon of Information (FOI) request. The next stage is for the proposals to be considered by the Council’s Executive Board, probably at their July meeting. If approved a planning application will be submitted which will be considered by the City Plans Panel. Construction could start in 2019 with the site operational by 2020. The electric buses serving the Park & Ride will stop at First Direct and the College of Building as well as the city centre. It is anticipated that buses travelling against the main commuter flow will be well used by staff and students accessing these sites from the city centre. The Stourton Park & Ride links into planned improvements to Hunslet Road and Low Road to improve bus performance along the A61 corridor.